it's not unusual for beginning do-it-yourselfers and woodworkers to be a little intimidated by routers. They're loud, aggressive shaping tools and tbey sometimes seem to have a mind of their own when it comes to following a guide or the edge of a board. But by keeping a few basic points in mind, and with some practice, these extremely versatile tools will amaze you with the variety and quality of work they can produce. Setup is a very important aspect of correct router usage. Make sure the hit is well secured in the collet and sot to an appropriate cutting height. The workpiece must tie secured, either with clamps or bench dogs or with a non-slip router pad like the one shown at left. If using a piloted edge-forming hit, you won't need a straightedge or guide for the router base to follow, although you secure scrap pieces the same thickness as the workpiece at each if you're only routing one side (.this prevents the router from following the corner and cutting into the adjacent sides). With non-piloted groove-forming bits, you'll need to use a straightedge or router guide to keep the tool cutting on line (See photo, left). Whether you're using a fixod-biise router or a plunge router, the bit should bo spinning at full speed before you apply it to the workpiece. Wearing hearing and eye protection, engage the bit into the workpiece and draw it toward yourself, keeping your body out of the line of the tool as host you can. To tie effective, the bit should cut against the rotation of the bit. In most cases, this means you should feed the router counterclockwise. Maintain an even cutting pace, and don't set the router down until the bit has stopped spinning. Always practice your cut on scrap wood before cutting the workpiece. Router bits fit into two generai categories: edge-forming bits and groove-forming bits. 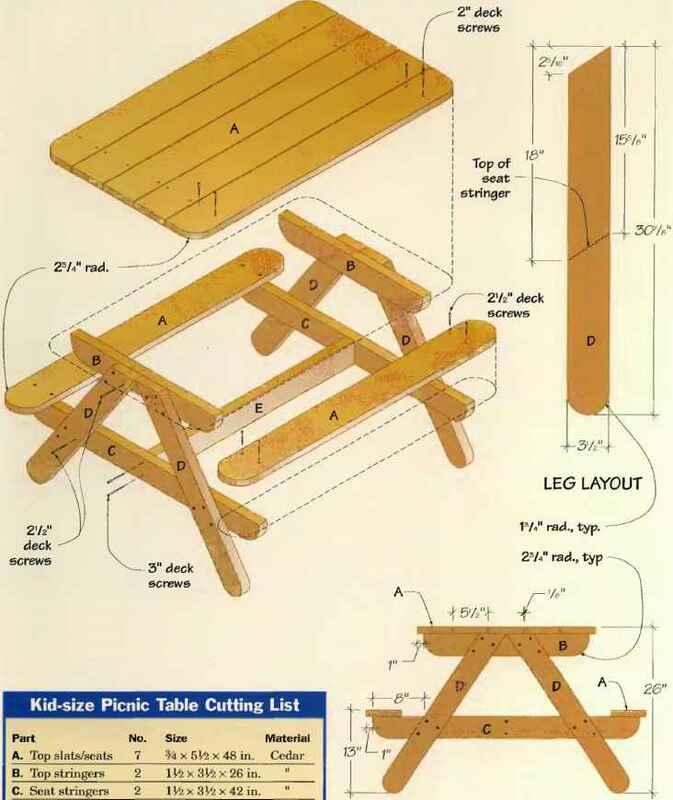 Edge-forming bits are used to cut decorative profiles on the edges of boards; they are equipped with integral pilots that guide the bit along the edge of the material being cut Some more inexpensive bits have fixed piiots that are an extension of the bit shank, but most today have bail-bearing piiots that aiiow the cutter to spin but won't burn the edge of the board as fixed piiots can. Groove-forming bits cut channels of various profiles Into the material. Except when carving freehand, they require a cutting guide. Most basic bits are made with either a V4-in. or Vi-in.-dla. shank. 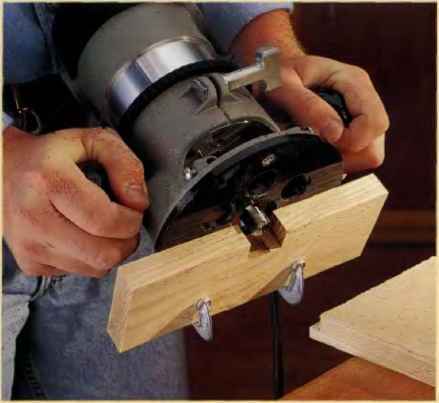 Bits with a iarger cutting radius can oniy be used with a router that accepts a V^-in. shank. Unless otherwise noted, the sizes iisted beiow refer to cutting radius. RO UN DOVER BIT. Piloted bit eliminates sharp edges. Available sizes: Vie, Mi, 3/16, V4, 1/2 In. ; Vi in. shank only: 3/4, 1, lVs, 1V4 in. PILOTED RABBETING BIT. 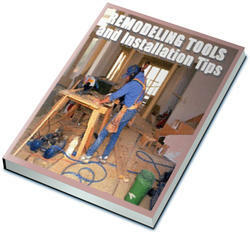 Cut rabbets, tongue-and-grooves and shlplap joints without need for straightedge or other guide. Available sizes (by depth of cut): V4,3/s, Vi> In. ; Vi In. shank only: 3/t In. Can also purchase rabbeting bit with Interchangeable bearings varying rabbet depth. DOVETAIL BIT. Used to cut dovetail joints, generally with a duvetail jig. Angles of flutes vary between 7 and 14°. Available sizes: V4, 5/ie, 3/bt Vi, n/ie, 3/4 In. ; Vi In. shank only: l:Vi6,1 In. VE1NING (V-GROOVE) BIT. Used for carving, lettering and cutting decorative V-shaped veins. Most are 90° cutting angle, but 45s and 60° bits can be found. Available sizes: V4,3/s, V2, 3/4 In. ; V2 In. shank only: ^16,1,1V4, \Vi, 2 in. CHAMFER BITS. Piloted bit eliminates sharp edges, making smooth, clean angle cut Vast majority are 45° angle (both Vii in. and Vi in. shank). Can find bits with 15,22 Vi and 30° cutting angles as well. STRAIGHT BIT. Cleans up edges, cuts grooves, can be used for mortising and carving. Most have 2 flutes. Available sizes: V4, s/ie, 3/s, Vie, Vi, 9/ig, 3/4, 1 In. ; Vi In. shank only: 1%, I1/«, 2 in.